obstruction of the intestine (gallstone ileus). Cholecystitis (inflammation of the gallbladder) is usually the result of a gallstone lodging in the neck of the gallbladder or the cystic duct (one of the bile ducts). It may be triggered by a large meal or a meal with fatty foods. Acute cholecystitis is distinguished from biliary colic, which is the pain caused when gallstones temporarily obstruct a bile duct, but no gallbladder inflammation is present. Biliary colic pain tends to be less sharp, there is no fever, and the abdomen is less exquisitely tender. fluids, which are usually given through a drip into a vein. It is usual for the gallbladder to be removed in order to avoid further pain and complications. Cholangitis (inflammation of the bile ducts) may occur if your bile ducts become blocked and subsequently infected with bacteria from the small intestine. This is a serious condition requiring urgent treatment. jaundice (a yellow discolouration of the skin and whites of the eyes). a procedure known as endoscopic retrograde cholangiopancreatography (ERCP) to unblock the bile ducts by removing the gallstones. Gallstones that block the bile ducts and cause jaundice without inflammation also need to be removed. Pancreatitis (inflammation of the pancreas) is a potentially serious disorder that occasionally develops in people with gallstones. It is more common in people with numerous small stones, and occurs when gallstones obstruct the duct leading from the pancreas (pancreatic duct). Acute pancreatitis requires urgent hospitalisation. a procedure known as endoscopic retrograde cholangiopancreatography (ERCP) and sphincterotomy. 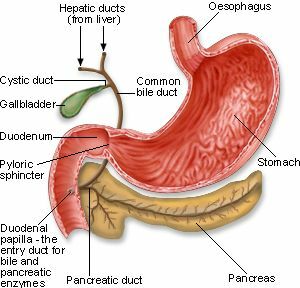 ERCP involves visualising blockages in the bile ducts and removing the gallstones that are causing the blockage. Gallstone ileus is a condition where gallstones obstruct the small or large intestine. Gallstone ileus can happen when an inflamed gallbladder becomes stuck to the intestine, and the gallstones erode their way through the gallbladder wall and into the intestine where they cause a blockage. The treatment for this is urgent surgery to remove the gallstone and relieve the bowel obstruction. Having gallstones can increase the risk of developing gallbladder cancer, but this type of cancer is rare — most people with gallstones never develop gallbladder cancer. Surgical removal of the gallbladder is usually recommended for people who have had complications resulting from gallstones. 1. Acute cholecystitis (revised October 2014). In: eTG complete. Melbourne: Therapeutic Guidelines Limited; 2015 Jul. http://online.tg.org.au/complete/ (accessed Aug 2015). 2. Ascending cholangitis (revised October 2014). In: eTG complete. Melbourne: Therapeutic Guidelines Limited; 2015 Jul. http://online.tg.org.au/complete/ (accessed Aug 2015). 3. Acute pancreatitis (revised February 2011; amended October 2014). In: eTG complete. Melbourne: Therapeutic Guidelines Limited; 2015 Jul. http://online.tg.org.au/complete/ (accessed Aug 2015). 4. MayoClinic. Gallstones (updated 25 Jul 2013). http://www.mayoclinic.org/diseases-conditions/gallstones/basics/symptoms/con-20020461 (accessed Aug 2015).